Need based micro-planning and people’s participation has brought a new ray of hope to the natives of Pilhori and Bharog-Baneri panchyats, one of the remotest area of Sirmaur district of Himachal Pradesh. While the former is making good use of Bhabher grass, the latter has excelled in making traditional products from Khajoor leaves. Thanks to the concerted efforts made under the Forest Reform Project, a sea change has been brought in the socio-economic condition of these two panchyats (Pilhori and Bharog-Baneri) under Paonta Forest Division. Two ranges of Himalayas i.e. Mid-Himalayas and Shivalik Range pass through the Paonta Forest Division. The forests of Paonta had been over exploited for timber wood extraction for the period of 20 years w.e.f 1860 to 1880. Over exploitation of forest not only deteriorated health status of forest but also created miseries for life of local inhabitants. In order to resolve this exigency, a forest settlement process for scientific management of forest was initiated in 1895, wherein, all forests under Paonta Forest Division were declared as reserve forest. These panchayats were chosen under DFID-UK (Department for International Development-UK) funded Himachal Pradesh Forest Sector Reforms Project in district Sirmaur in 2003. In comparison to other panchayats, much of expenditure had not been incurred in these two panchayats under different project activities. But whatever work has been accomplished, are in reality, linked with forest conservation and livelihood of poor people. The people of Pilhori panchayat are striving hard to conserve and sustain the health of forests. 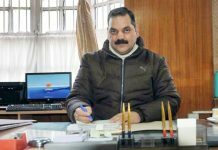 Pushpender Rana, DFO (Divisional Forest Officer), Paonta Forest Division, himself has played an active role in dissemination of aims and objectives of the project. Pilhori panchayat lies at the last corner of district Sirmaur and touches the boundary of Haryana state. This panchayat is inhabited by 1,425 people, out of which, 140 families belong to the notified Scheduled Tribes and 50 families to Scheduled Caste. This panchayat has 148 hectares of agricultural land. Due to smaller land holding and absence of irrigation facilities, most of the people live below the poverty line and thus are largely dependant on the forests for their survival. Animal husbandry is the main occupation of the people of this area. 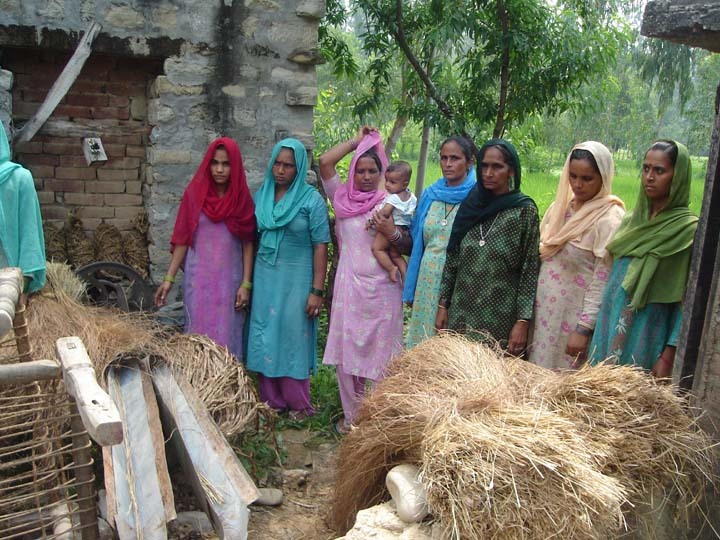 Majority of the families in the panchayat belong to the Gujjar community. Increased demand for supply of fuel, fodder, Bhabher grass and water, coupled with illegal felling and grazing in the recent years has resulted in diminished size of the forest area. Taking note of this serious development, Rana took up the challenge and initiated the process for making the people aware about the scientific and better forest management practices. 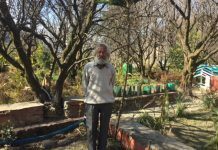 He inspired the people for preparing a micro-plan under the HPFSR (Himachal Pradesh Forest Sector Reforms) Project to tackle the decreased forest size along with justified use of local forest resources for sustainable development and strengthening of the rural economy. To discuss different activities of the project in detail, a general meeting was organised with the people of Pilhori. One of the main suggestions, which came forth during this meeting, was to conserve Bhabher grass on a large scale and use it for Ban (rope) making. To achieve this objective, women of this panchayat formed a self-help group (SHG) and protected/conserved 17 hectares and 16 hectares of forest land during the year 2003 and 2004 respectively. This conserved area was cleared of lantana weed and other thorny bushes to achieve enhanced production of Bhabher grass. HPFSR Project came forward and helped the people in this task by way of providing cumulative wages to the tune of Rs 1,20,000. Out of this amount earned as wages, people contributed a portion to purchase one rope-making machine and started rope production. According to Surjeet Kaur, a Group Organiser of the panchayat, rope-making efficiency has increased many folds after purchase of the machine. She further adds that these ropes are in great demand in the local markets where people use it for thatched roof making, mat making, and for mouth nets for cattle etc. Besides these, Ban (rope) made from Bhabher grass is in great demand in the neighbouring state of Haryana as well. According to Yasseen Ali, a forest guard, good quality of Bhabher grass is being produced in this region. This panchayat has five wards namely Navadia Basti, Numberdar Basti, Pinja Basti, Khareni and Gadagohi where SHGs for milk, rope and vegetable production have been formed. Bharog-Baneri panchayat is another panchayat in this Forest Division, which has shown keen interest in the activities of the project. This panchayat has five wards inhabited with a human population of 1,600 people and it too falls under Poanta Forest Division. Sixty-five families of this panchayat live below the poverty line. Agriculture and animal husbandry here too is the main occupation of people, which adds to their enhanced forest dependence. This panchayat has been selected under HPFSR Project and a sum of Rs 20 lakh has been spent under different project activities. Under this project, a water harvesting structure has been constructed at Vaha-Kelewala ward, which has resulted in elevation of water level in the region. Forest guard of this area informs that the water level in irrigation channel has recorded a rise and water mills have become operational after many years. According to Harisaran, the local Block Forest, pasture development and grassland development work has been undertaken at Saman Kanau and Pudali village respectively. After the construction of two water tanks, enough potable water and irrigation facilities have been provided in the panchayat. Women SHGs of this panchayat formed under this project have started producing different products /articles out of phoenix/Date leaves. According to Rana, women are a very sensitive and energetic section of any society and if their work force is associated with production, it can lead to social development and create an environment for women empowerment. While enlisting the potential and scope for undertaking different project activities at a panchayat meeting, women of this panchayat identified Khajoor work i.e. product making from the leaves of Date Tree (Phoenix species) as one of the main potential activity. Many factors like large scale production of Date trees in the panchayat forests, private land, good potential and market for Date products prompted the women SHG to select this activity as means of livelihood. Khajoor leaves production in the entire area was got surveyed. Today, the entire village is involved in collecting the Khajoor leaves. The major chunk of Khajoor leaves production is being utilised as fodder for cattle and a little portion of the leaves is left for making traditional products. Raw material is another problem for any Date based industry. However, the Gram panchayat persuaded the SHG to spare some Khajoor leaves for making traditional products. To meet the objective, Khajoor SHG of women in the panchayat has identified 10 hectares of forestland for Date tree cultivation and Khajoor leaves production. This protected area was properly cleaned and cleared of unwanted bushes and weeds enabling Date and other tree species to grow properly. The responsibility for management of this protected forest too rests on the women SHG. To protect this upcoming date tree forest, engagement of some watchman in near future is under consideration. The rules and set-up of an organisation required for operating a small-scale industry were discussed at length and it was decided to collect Rs 10 as membership fee per woman. Women members of SHG organised a special meeting in January 2005 in order to evaluate their efforts to meet the objectives. Various articles being made by these SHGs from Date tree leaves include, mats, trays, caps, vases, carry- bags, baskets and different ornamental articles. Reeta, Secretary of the SHG, says that Khajoor articles prepared by these SHGs amounting to Rs 40,000 were sold at the various exhibitions organised at Renuka, Dehradun and at other places. Ten per cent of the total amount earned was deposited in a bank by these SHGs. The Panchayat pradhan while appreciating the project activities informs that the production of cash crops has enhanced after the creation of irrigation facilities under HPFSR project. He though suggests that different species of trees can be planted in the panchayat forest and village common land could be brought under medicinal trees/plants cultivation. Besides this, he demands a complete ban on the entry of migratory graziers in their forests as they lead to destruction of new plantations every year. 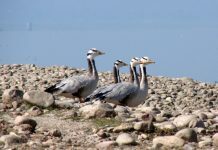 From this story it is felt that the forest department should work more closely with the communities and should seek active participation in their conservation. the forest department is also realizing that it should also consider the dependence of local people on the forest and should involve people in planning for the livelihood and conservation activities so that people may use forests as resources for livelihoods in a sustained manner. The realization that if people are well off, their dependence on the forests will automatically decline thereby reducing the pressure on the forests. Such a situation will guarantee an improvement in forest resources and the schemes/programmes of the forest department. I am Nitin Sharma belong to Chintpurni, district UNA. For the last so many years, I have been the constant observer of what had happened to our culture and ethics. actually I am talking about the change in behavioral pattern and change in life cycle of himachali, such as most of the male member of the family are shifting to city for the search of life and job, however many of has them turned into wrong direction and do not come back, as and when they come back they either sell they property or convert them into hotels and motel. Seriously speaking I am not against the development, however i am in the favor of it provided it is through sustainable approach. there are so many approaches by which we can make our Himachal into real good and lovable home town as it is now and be forever, by creating job opportunities like development of small scale industries, even for the same himachal government has lot f funds or from developmental banks like WB and UNICEF.